Edison Arantes do Nascimento also known as Pelé was one of the greatest football players ever. 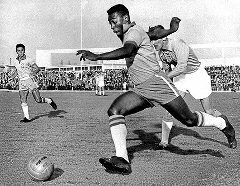 Pelé started playing football at Bauru FC where he was trained by former international Waldemar de Brito. Soon all great clubs of Brazil were after him. He choice for de Brito´s former club Santos FC were he made his debut at age 15. Pelé made his debut at the World Cup with Brazil in 1958, at only 17 years of age. He became the youngest player ever to score a goal at the World Cup by scoring the decisive goal against Wales in the quarterfinals at 17 years and 239 days. In the semifinals he scored a hat-trick against France in a match that Brazil would win with 5-2. In the final against Sweden Pelé scored another goal in the 5-2 victory. Brazil became World Champion and Pelé was the greatest revelation of the tournament. At Santos Pelé dominated the Brazilian League by winning the Brazilian national championship five times in a row from 1961 to 1965. He won the Copa Libertadores(South American Champions League) in 1962 and 1963 and the 1962 Intercontinental Cup by beating Eusebio's Benfica with 5-2, Pelé scoring a hat-trick. In Brazil's first match of the 1962 World Cup against Mexico, Pelé assisted the first goal and scored the second goal. It looked like it was going to be Pelé's tournament again, but it wasn't. Pelé was hiding a groin injury to keep playing, but this became visible at Brazil's second match against Czechoslovakia. Pelé had just shot on the post and tried to shoot the reflected ball but injured himself. He was forced off for the rest of the tournament, despite that Brazil won the tournament due to a great Garrincha. It was the 1966 FIFA World Cup, held in England. Pelé was back without injury and scored in his first match against Bulgaria, Brazil won but Pelé had been brutally fouled by the Bulgarian defenders and could not play the second match against Hungary. Brazil lost his second match and Pelé was forced to come back and play the decisive match against Portugal. Pelé was fouled again by the Portuguese players. However it was the foul João Maorais made on him that injured him. Pelé limped on the field for the rest of the game and Brazil lost with 3-1. Pelé played his last World Cup in 1970 at age 29. 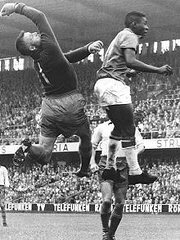 Pelé scored one goal in Brazil´s first match against Czechoslovakia which was won with 4-1. Pelé nearly scored with a header against England but Gordon Banks saved spectacularly. Against Romania Pelé scored twice in the 3-0 victory against Romania and Brazil was is in the quarterfinals. They won the quarterfinal against Peru with 4-2, Pelé did not score. In the 3-1 victory against Uruguay in the semifinals Pelé was involved with the last 2 goals. Brazil dominated the final against Italy, Pelé opened the score with a header 1-0. The match was won with 4-1, the final goal being one of the most famous goals, showing Brazil's class at that World Cup. Pelé became the only player ever who won the World Cup thrice. Pelé ended his career in the US at the New York Cosmos as a "ambassador for football". He remains one of the greatest players ever. He was great in all aspects of the game, he was great in heading, dribbling but above all shooting the ball with both legs. This is why he scored more than 1200 goals.